John Stanley, who’s “always in the musicals” said he’s impressed with the grand scale of this year’s show, how big it is and how much is taking place on stage. “The choreography is one of the better parts of this musical,” he said, though as Crutchie, the newsboy who walks with a crutch, he’s limited to what he can do. One reason this show seems larger than life is the purchase of a projector that can create large and wide images for the scenes. 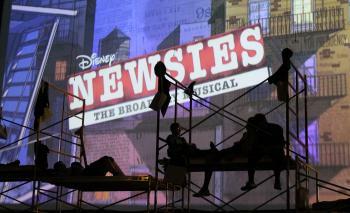 “I had this crazy idea to do projected back drops,” director Natalie Hamilton said, after seeing one in use at Pittsburg. “This is what the pros do.” New technology makes it possible to create scenes at the back of the stage without having a projector beaming light across the audience. Hamilton made phone calls, talked professionals, researched what was available and affordable and then approached CHS Principal Brian Campbell. They came to an agreement and the district made the significant purchase of a projector that could throw a wide screen image onto the cyclorama at the back of CHS stage. “Our projector is only 10 feet from the screen and it’s projecting a clear image that is 35- by 20-feet,” Hamilton said. Financially it was a good move. To rent one backdrop for a stage the size of CHS can cost $300 to $600. “It’ll save a lot of money in the long run,” Campbell said. Besides the musical, it can also be used to put an image behind the band concert, or at vocal concerts and school dramas. It also doesn’t take a technician to run it. Hamilton pointed to her laptop and said the images on her computer are talking to an Apple TV through Bluetooth. No internet and no wires required.